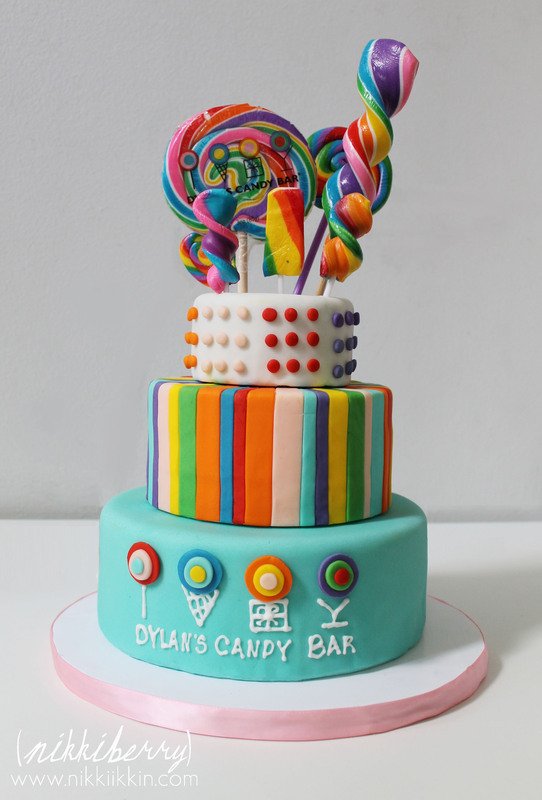 After a promise made more than two years ago, Macy’s dream party at Dylan’s Candy Bar in Manhattan will come true in just a few short weeks. 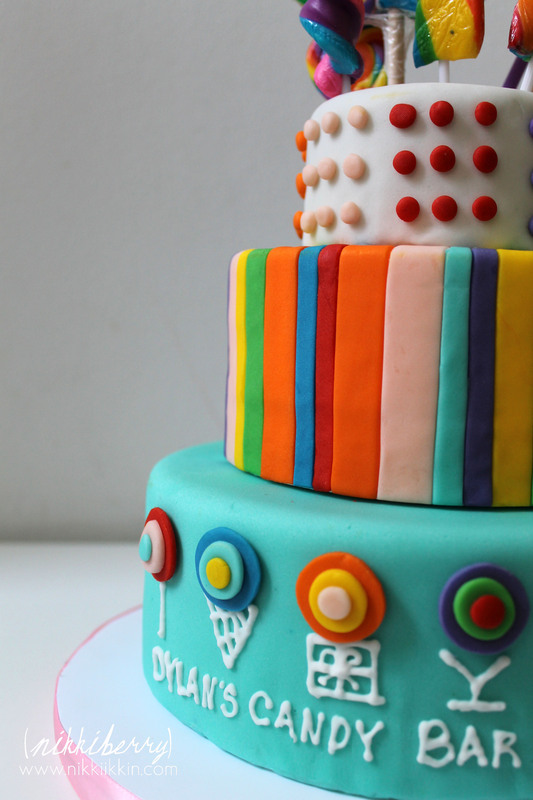 This weekend 10 special little girls received this original and SWEET birthday party invitation. 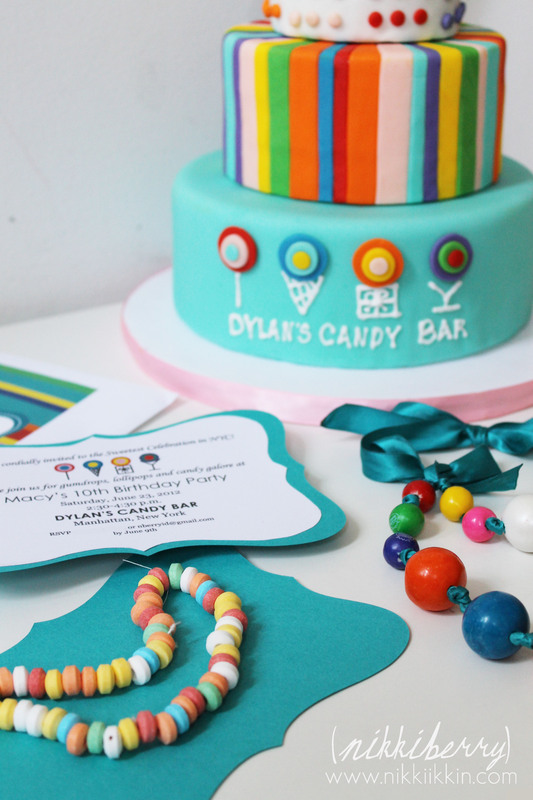 Although a Dylan’s Candy Bar Sweetie Pie birthday party is all-inclusive and the fill in invites they provide are perfectly fine, I can’t help myself from using this opportunity to create something fabulous. 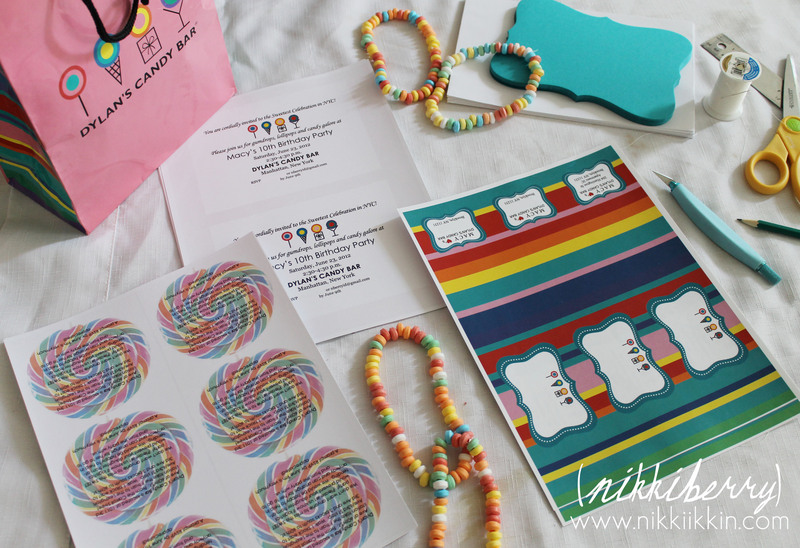 I knew from the start that I wanted to send the girls candy necklaces with the invitation but the style of the card came to be after I stumbled upon the bracket shaped cards from Paper Presentation. They come in a color called Fiji that looks like the exact shade of teal that is a Dylan’s Candy Bar signature color. Once I had the bracket card, designing the rest of the invite was a piece of cake! 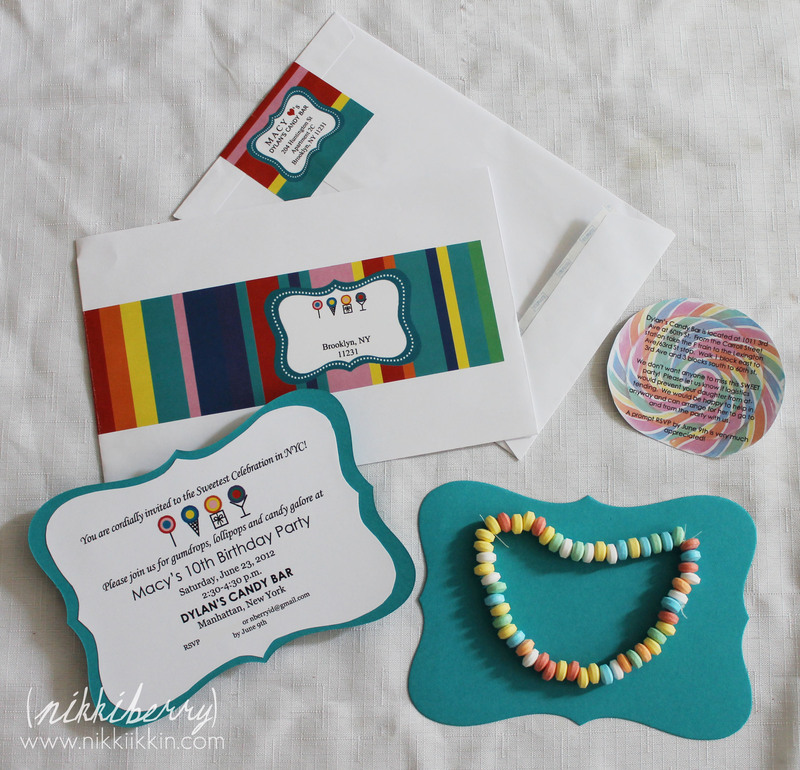 Here is how I created this special invitation for my special little girl. 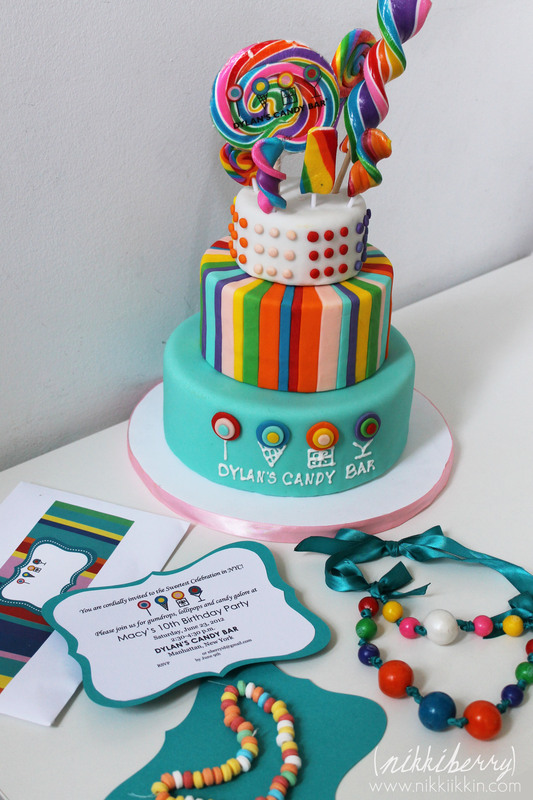 For the address label wrappers I used Photoshop to create a striped design in Dylan’s Candy Bar colors, I downloaded the bracket shape from Paper Presentations web site & I printed them on full sheet label paper. The base of the invite is a 5×7 pre-shaped bracket card from Paper Presentation. The bracket cards also come in 4×6 for layering but Im not sure how I would print on that shape so I made my invite on regular paper, carefully measuring the words to fit within a 4×6 space. 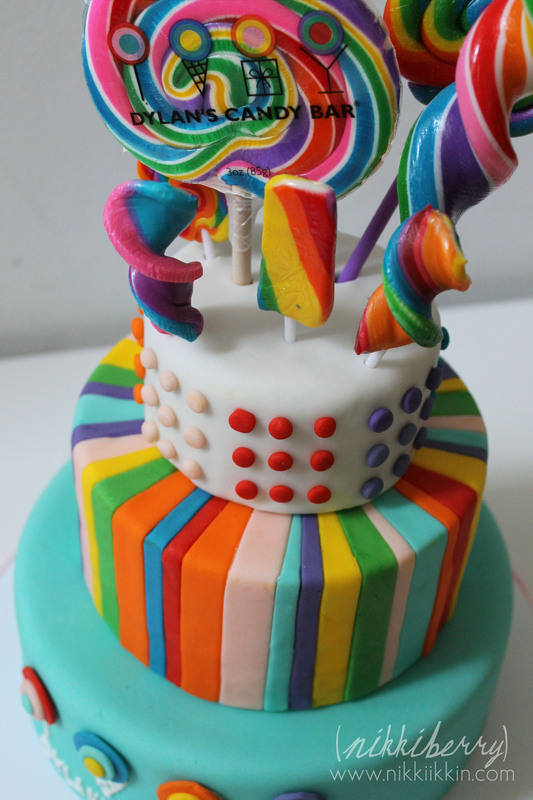 I didn’t want to put directions on the invitation, so I added an additional lollipop shaped card. To make this I used an image of a lollipop from a candy website and altered it with a brush stroke filter in Photoshop. The envelopes are regular 6×9 white envelopes, we hand delivered nearly all of them, a padded envelope would be better for mailing. 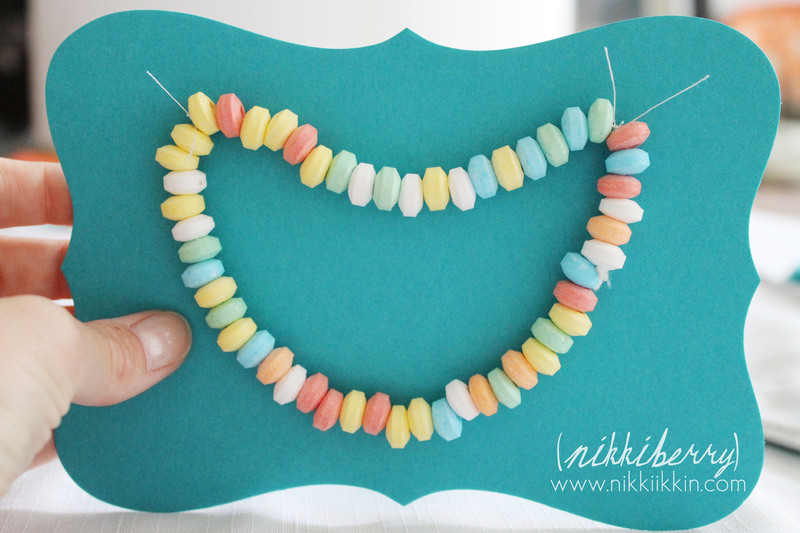 Real candy necklaces make this invitation extra sweet! The address label wrappers, lollipop note and printed bracket cards are cut out and ready for assembly. 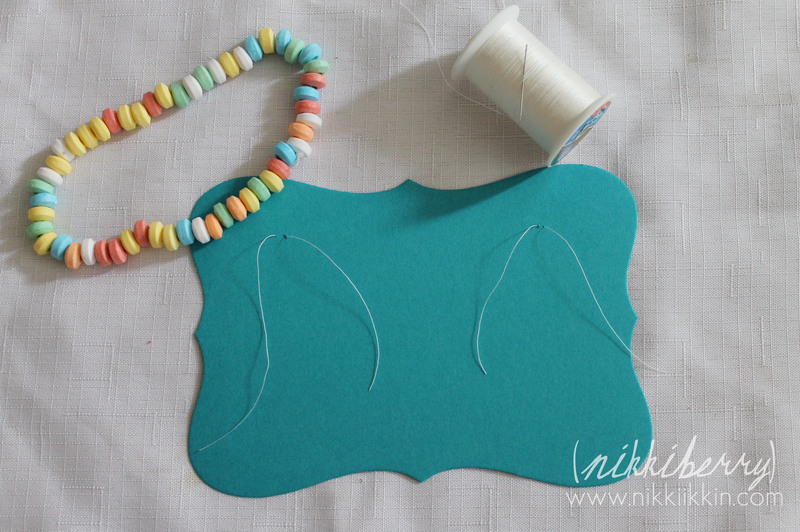 I wanted the candy necklace to still be edible so affixing with tape and glue were out of the question. 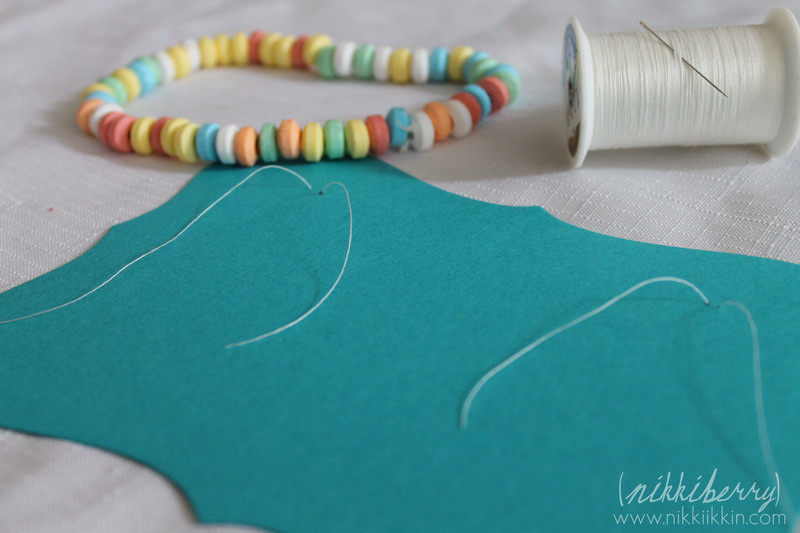 I sewed the necklace to the back of the card with two quick loops of thread. It was very important to do this BEFORE glueing on the printed front bracket card layer because the stitches needed to be hidden on the front. 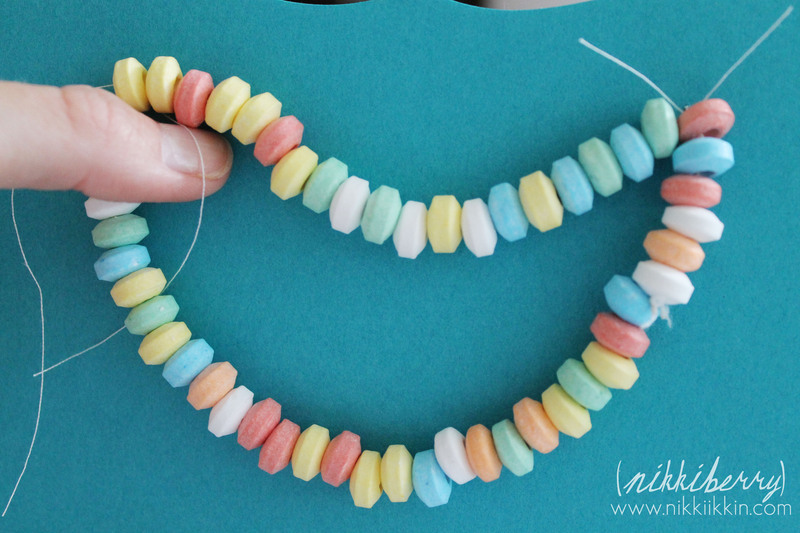 The first side of the candy necklace ties on at any point. 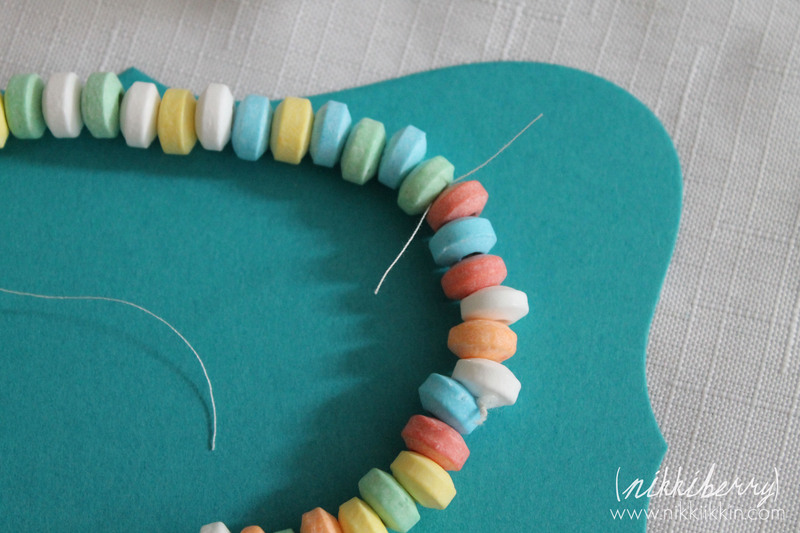 The spot to tie the second side is judged by how you want the candy necklace to drape. I stood it up and held the spot with my finger. Theres no right or wrong way, just as long as the necklace is entirely within the boundaries of the card. Macy liked the shape because it looked “like a smile”. Using spray adhesive (outside on a surface protected by a paper bag) coat the back of the printed white bracket card layer. 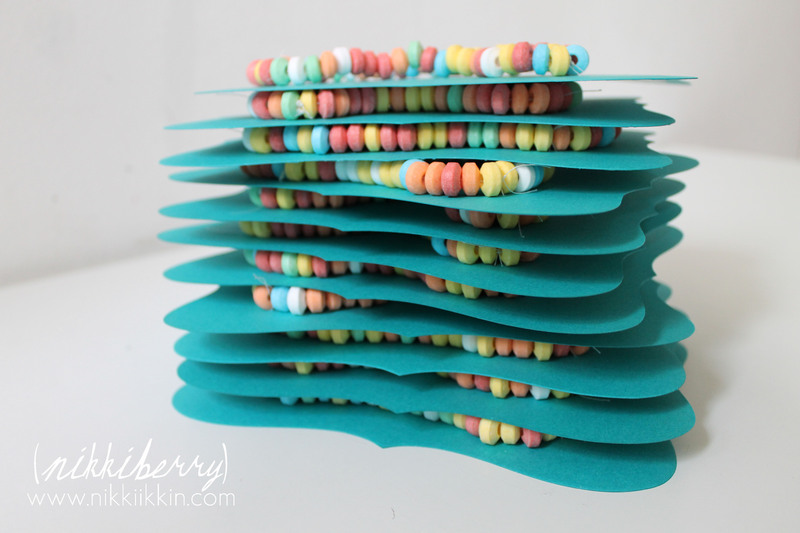 Adhere it to the front of the base bracket card with the candy necklace sewed on the back. Full sheet label paper makes the address label wrapper supper easy to peel and stick but you could print them out on regular paper and glue them on instead. 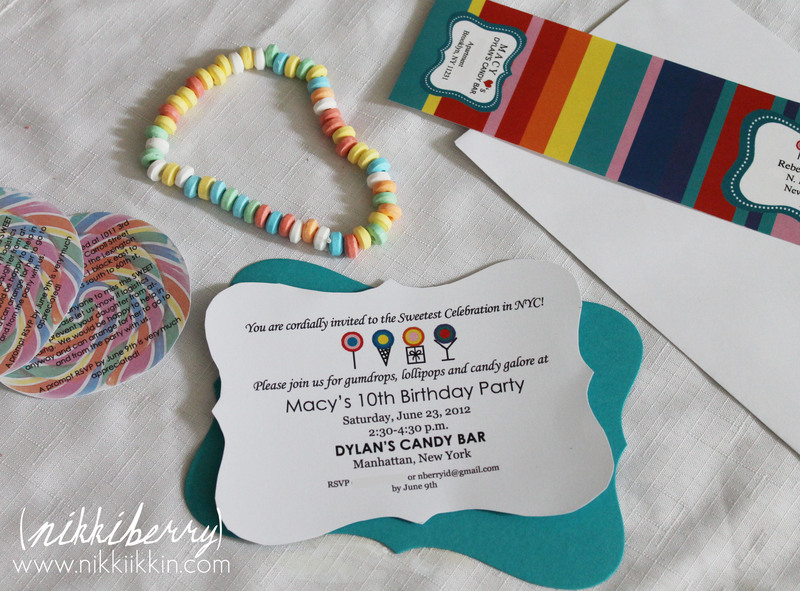 I can’t wait to share Macy’s 10th birthday party at Dylan’s Candy Bar with everyone, look for that post after June 23rd.